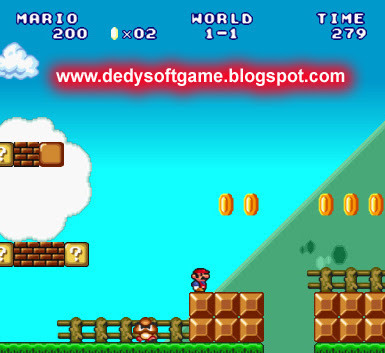 Mario is a fictional character in the video game, created by video game designer Shigeru Miyamoto. The mascot of Nintendo, Mario has appear in over 200 video games since making. Mario currently appears in many different types of video games, such as racing, puzzle, role-playing, fighting, sports, and more. Mario described as a short Italian plumber and fat in the Mushroom Kingdom. In the Mario series, he repeatedly stop Bowser plans to kidnap Princess Peach and conquer the Mushroom Kingdom. He also has other enemies and friends. As Nintendo's mascot, Mario is one of the most famous character in video game history, and Mario became synonymous with video games. Mario games have sold more than 201 million units, making the Mario series as a series of top-selling video game. Mario was created by Shigeru Miyamoto in his quest to create the best-selling video game for Nintendo, after previous games, such as the Sheriff, not achieved sekses. Originally, Miyamoto wanted to create a video game using the characters Popeye, Bluto, and Olive Oyl. However, he is not permitted to use these characters, so eventually he made Jumpman (later known as Mario), Donkey Kong, and Pauline. Mario mission is to conquer Bowser kidnaps Princess Peach. Bowser also want to beat the Mushroom Kingdom. Some characters in Mario are: Protagonist: - Mario - Luigi - Princess Peach - Wario - Waluigi - Daisy - Toad - Yoshi - Rosalina - Toaddette - Koopa Krag - Wiggler - Donkey Kong - Diddy Kong - Dixie Kong - Ninja - White Mage - Black Mage antagonists - Bowser - Bowser Jr.. - Kamek - Dry Bones - Shy Guy & Fly Guy - Piranha Plant - Pocket chomps - Goomba - Green Shell & Red Shell - Hammer Bro - Isabell - Scuttlebug - Cheep-Cheep - Monty Mole - Whomp - Boo - The Pumpkin Head - Dragon Plant - Spear Guy - Pirate Guy - Guy Bomb - Bloocheep - Alien - Bob-OMB That character - a character in the story of Mario. They also use a weapon in adventure, for example: Green Shell & Red Shell, Fire Flower, Ice Flower, Cannon Ball, Yoshi Eggs, Bomb Shell, Bomb, etc.. Mario et normally eat mushrooms in the adventure to add to their lives. 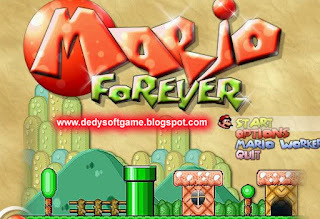 Mario Forever is made to follow the design and how to play the game Mario Bros. Nintendo's classic. You will experience an environment similar to the old Mario Bros with a few additions such as a more refined design, the colors are bright and sharp, although played in fullscreen view. 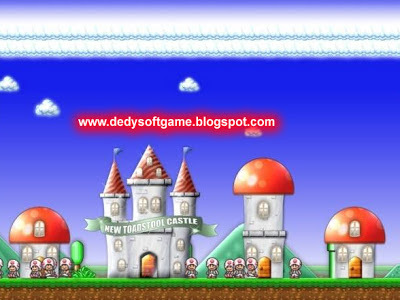 Each level is very well presented and the longer it will be more difficult and challenging. 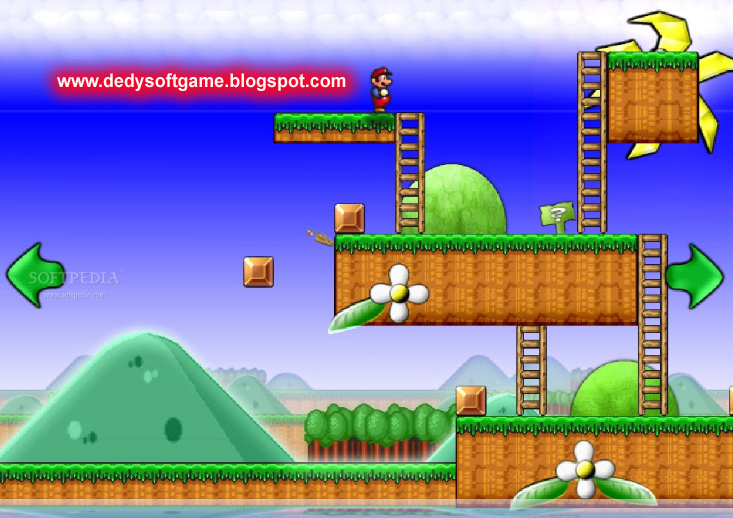 The game is also packed Mario Worker applications that can help you make your own game levels. You can set environment is nothing like adding clouds, obstacles, and the level of the story so that you make the game come alive. The results can later be uploaded and you can also download the game levels created by others. This game was developed after Mario Forever with different gameplay. Genre that carried the action-shooter with a view from above. 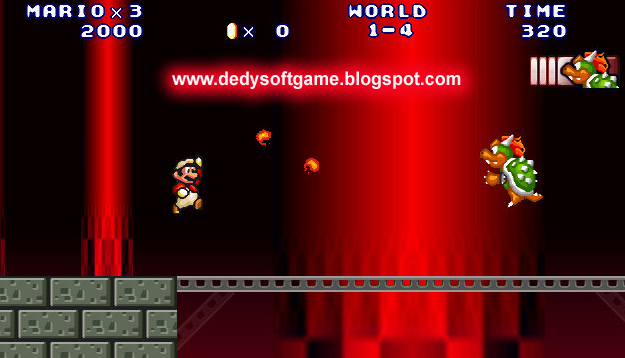 In this game players will help Mario rescue a princess who was kidnapped by Bowser to another planet. Mario is not alone in completing this mission, you can choose Luigi, Kinopio (creatures of the kingdom muschroom) and Samus Aran from Nintendo games are also quite popular Metroid series. Each character has its own distinct abilities. Each mission will use a spacecraft that can be upgraded with 60 different types of weapons to the level of power that could be improved. In this game we're past 8 folders that have strong bosses. The Legend of Zelda Link to the main character in the game design results Shigeru Miyamoto actually has a lot of elements like action, adventure, RPG and puzzle, but Buziol Games Soft chose to just take a few elements that combined elements of puzzle adventure game. In this game our little hero Link will try to save Princess Zelda and the kingdom of the devil attacks Sarcophagus. When playing this game you will enter a colorful world with 100 different game levels, map vast, secretive and supportive atmosphere accompanied by music played.